The clutter is standing in your way of getting organized, so you are working through it. You are making a ton of progress and finally getting rid of junk, when suddenly you catch sight of it. There it is. That box of pens that you haven’t really touched in years except to add more pens that you really don’t like to use. Last week you were at the store and you bought yourself a new pack of pens, because you do have your favorite kinds that you like to use regularly, but … what if … what if you get rid of this box of pens and then you need a box of pens? That would be awful, wasteful, and just annoying. So you get stuck. You were making great progress, but now you’re torn about this blasted box of pens. For you, it may not be pens, it could be anything else – shoes, blankets, serving dishes, mugs, toys, books, papers, appliances, and more. The possibilities of what could get you stuck are endless. No matter the thing, your mental trick for breaking through these blocks is the same, even easy if you let it be. Remind yourself of your goal: get rid of the clutter so I can get organized. I want to be organized so that ________ (fill in the blank). Then ask: Would I give up this box of pens to get organized? That simple question is the most powerful question to ask yourself. I know that some of you reading this are fighting the simplicity right now. 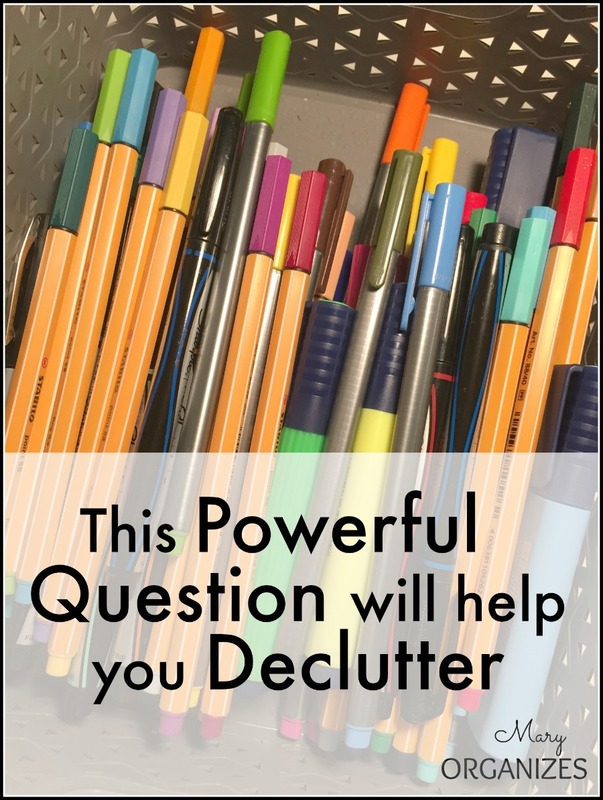 You might be thinking that a followup question might be – “Yeah, but would keeping this box of pens really get in my way of organizing?” In my work as a professional organizer, I’ve helped more people through decluttering than I can count. I’ve learned that a box of pens might be right for someone to keep and not for someone else, which is why I hesitate to say exactly what you should save and keep. I mean, wouldn’t it be nice if I could just publish a list of approved household items and quantities, then you could just compare your belongings to the list? It is just not that simple, which is why I want to help train you how to ask yourself the right questions and trust YOUR answers. I want you to learn to be confident about what you keep and confident about what you pass on. When you are just learning how to truly let go and declutter, you have to take a few leaps of faith so that you can learn how it feels to land. Ask yourself: Is this item worth my time debating it when I’ve got so much more work to do? Is this item worth living disorganized one more day? Is this item worth the time and effort to sort it, store it correctly, and maintain it? Be honest with yourself and your answers, so that you will start trusting yourself and declutter with confidence. What is standing in your way of being organized? LOL. Perfect timing for this post. Going back and getting rid of some more pens. Am stuck right now on old towels. That will end today. Thanks. You are doing awesome with your decluttering!!! And yes, I just want to train everyone to trust their sense of what works for them. I am so impressed with all of your progress! Those are some nice looking pens. Did you have something to say about clutter? I couldn’t get past those lovely pens! 🙂 Seriously, i have a bundle of those Stabilio pens that go in and out of the give away pile. I love them, but prefer pens that are waterproof. I wrote a colorful Thanksgiving list a few years ago that mostly washed away when my husband spilt gravy or something very wet on it. I do ask myself a variation of your question for other things; books mostly. For example, I have a collection of weight loss books. I ask myself if I were at my perfect weight, would I keep the book? Since I’ve had some of them for years and I’m not reading them, it made it much easier to let them go. When I’m ready to work seriously on weight loss, I can get a book from the library or find information online. A book that I’m not reading is not going to help me lose weight. I have a suggestion of what to do with excess pens; take them to a local restaurant. I did this and you would have thought I took them a box of gold! Servers’ pens are often accidentally taken by customers or are misplaced and it becomes a significant expense. Now when we visit that restaurant, we get extra special treatment. I knew the pen was mightier than the sword, but I didn’t know that it would get me special treatment at a restaurant! we had some extra school supplies last year that the kids wasn’t going to use. so we took them to one of our favorite teachers for her to use and to give to the kids that needed them. Felt good to give to someone that would use them….same for some of the little kids books that we had bunches of….kept some but about half went to the teacher for her class to use. love to see a kid enjoy reading..thats why we had so many…. I love the idea of giving good school supplies to teachers. If they can’t use them, I bet they know someone who could!